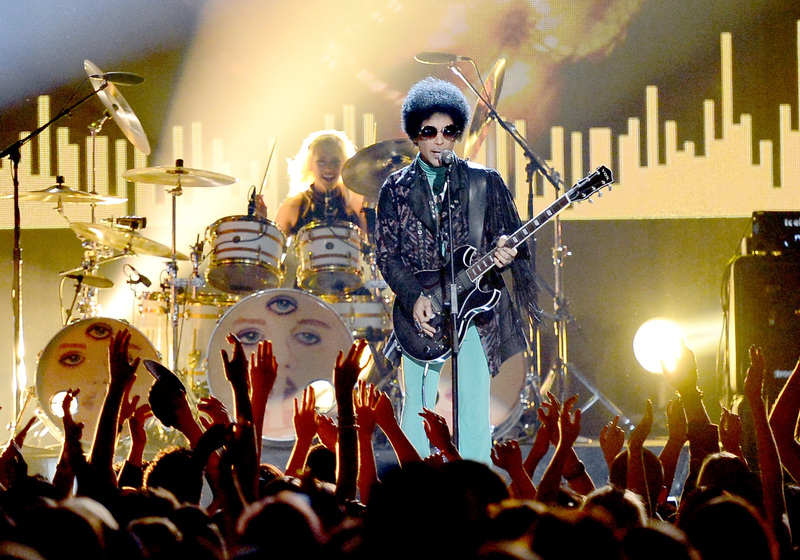 When a beloved icon passes away, it's never long before the tributes and memorials from fans start pouring in, and the death of Prince has proven no exception. When it was announced on Thursday, April 21, that the singer had died at the age of 57, Twitter and Instagram were immediately filled with people expressing their heartbreak and disbelief that he could've passed away, and posting gorgeous, memorable Prince tributes. Prince's publicist confirmed the singer's death in a statement to Bustle, writing that "It is with profound sadness that I am confirming that the legendary, iconic performer, Prince Rogers Nelson, has died at his Paisley Park residence this morning at the age of 57. There are no further details as to the cause of death at this time." While many of the things Prince's fans and fellow celebs wrote and posted about him are memorable, one Prince tribute stands out from the rest, for how haunting and perfect an image it is. Posted by Twitter user Kashana (although it's unknown who originally created it), the image shows the singer as the "Little Prince" of Antoine de Saint-Exupery's famous novella. It's a beautiful drawing, and one that's fitting for a star remembered for breaking boundaries and exploring creativity in incredible new ways.